One of the most compelling characteristic of pastels is their ability to create a variety of wonderful textures. When you see any of Degas' pastel drawings, you can't help but be enthralled by his sensuous strokes. You too can learn the simple steps to creating different textures in your pastel paintings. Keep in mind that you mix pastel colors directly on the painted surface, so you can either blend pigments or just use a broken color technique. Feathering is really a mainstay of pastel techniques. It is similar to hatching or cross hatching. You use thin, parallel lines of one color drawn diagonally on top of another. If you examine Degas' pastel drawings closely, you will find plenty of examples of the feathering technique. In my pastel works, I use feathering or hatching a lot: either over a flat area to revive dulled colors, or on top of another layer of hatched pastel color. By layering hatched colors, I achieve a woven effect which mixes the colors beautifully. Feathering can be done with both hard and soft pastels. 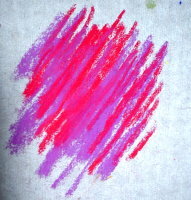 This is one of often practiced pastel techniques among many artists.I would suggest you use rubbing alcohol or turpenoid(turpentine substitute)for this purpose. 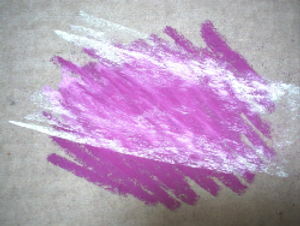 Either apply it to the painting with a brush or dip the pastel sticks into the turpenoid. Note that the colors will be flatted and smoothed, but they do not get as muddy as when you blend the pastel colors with your fingers or a stump. Be careful with this technique, as some hard edges around the washed area are inevitable. You will hear pastel artists use the terms glazing and scumbling interchangeably. Yes, this technique is pretty close to what you see in oil painting(It means painting an opague color over the dried layer). With pastels, scumbling is done by lightly dragging the broad side of a soft pastel over the existing layers underneath. This is where fixative comes in handy. To keep the glaze looking intact, your best bet is to use a workable fixative to make sure that under layers will not be disturbed. By gradually varying the amount of fixative you apply to different regions of a painting, you can create beautiful gradients in otherwise uniform colors. Hold the spray can close to apply more fixative (for darker tones) and gradually pull away from the painting as you sweep across the area where you want the color gradient. Or you can add multiple layers, with the areas you want darker receiving more layers and the lighter areas having only a few (or none at all). You can easily achieve a powder-puff texture with the dusting technique. I prefer to use hard pastels for this because the pigments hold better than soft pastels, and they don't break up like soft pastels do. Lay your painting flat on a horizontal surface. 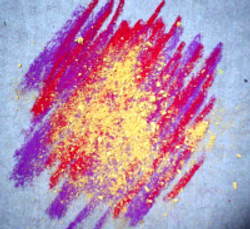 Then, shave pastel powder from your pastel sticks onto the painting with a razor blade or a sharp palette knife. Press the pigments in place with the blade or the knife and remove the excess. Practice these basic pastel techniques listed above and see what works for you and what does not. You will find your distinctive style as you become more experienced. And don't forget to vary the textures in your paintings to add some excitement! Another factor to consider when you create the textures you want in pastel paintings is the types of pastel surfaces you use. Find out different types of pastel papers that enable you to create different textures.